Looking for a place to hold your wedding reception? Do you want to have a Graduation Party, Anniversary Event, or Birthday Party but you don't have room for everyone in your home, why not rent our home? 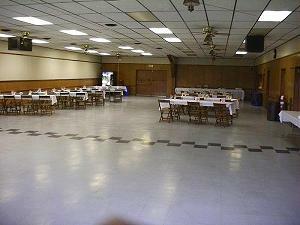 Does your business need a place to hold the Company Christmas Party or Company Picnic, why not rent a hall from us? Does your organization need to raise funds, but you don't have the space? Over the years other organizations have rented our hall for such things as Dances, Night at the Races, Breakfast with Santa, or Lunch with the Easter Bunny? Want to hold an outdoor event, but afraid of the weather? We can offer to you our 60'x100' storage building for rent. Three sides open up for that pavilion feeling. The interior has 14' ceilings, gravel flooring, overhead lighting, 40 electrical outlets along the perimeter walls, and no support beams to get in your way? This building is available from first week in May thru the end of September. 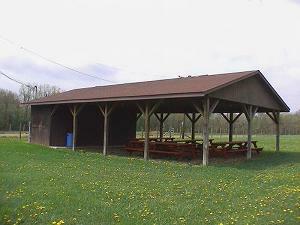 If our large building is too big for your needs, we can offer this outdoor pavilion. It comes with electric, refrigerator, and running water. 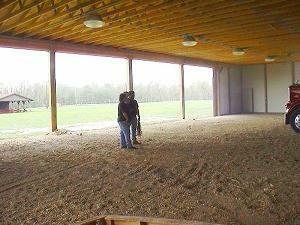 There's plenty of room for, volleyball, badminton, horseshoes, and softball. Want to hold a large event over an entire weekend and need lots of space? We have acres of flat well drained grounds with electrical hook-ups for 60 campers. We will gladly work with you to help make your event a success.